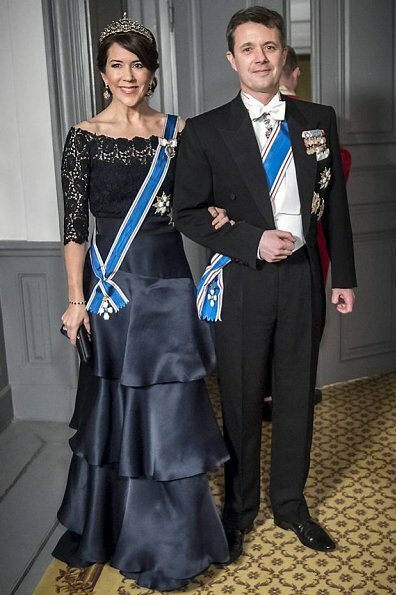 Princess Mary looks the best as usual. Beautiful color and style of the dress .Two fabrics goes very well together. Mary looks stunning. I wish I could have had a closer look at the earrings. Are they new? Also wondering, is Marie pregnant? I wondered that about Marie also as it's a strangely raised waistline. 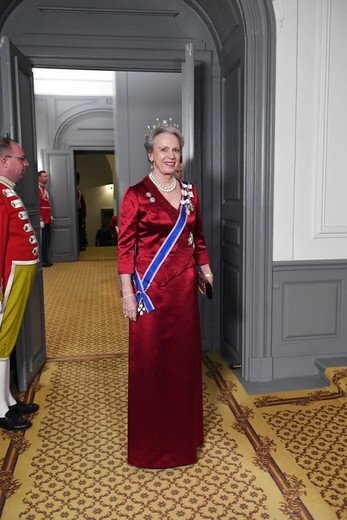 I love the color of princess benedikte dress. I agree Kristina, Mary looks amazing. 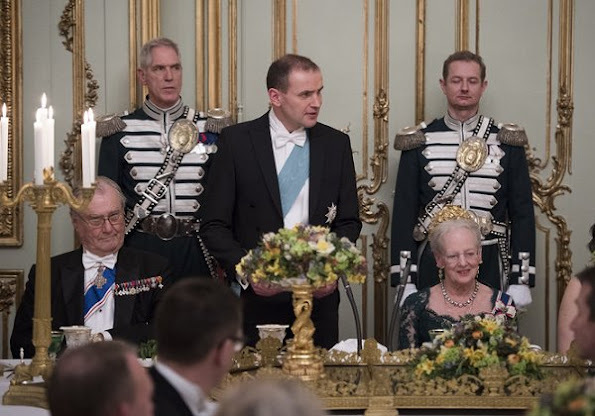 I must say Benedikte also looks stunning, that is a wonderful wine red on her. As for Marie, I think this is not the best she can do. I don't even know what to think of the T-Shirt neck and sleeves and the playsuit strings around her waist. 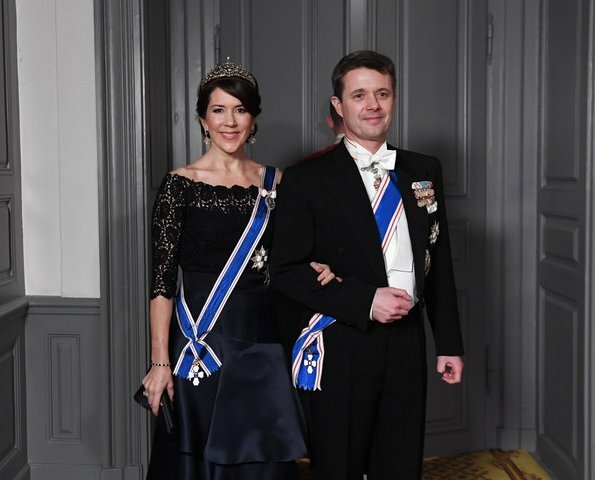 Benedikte is my clear winner of the evening, she looks stunning. 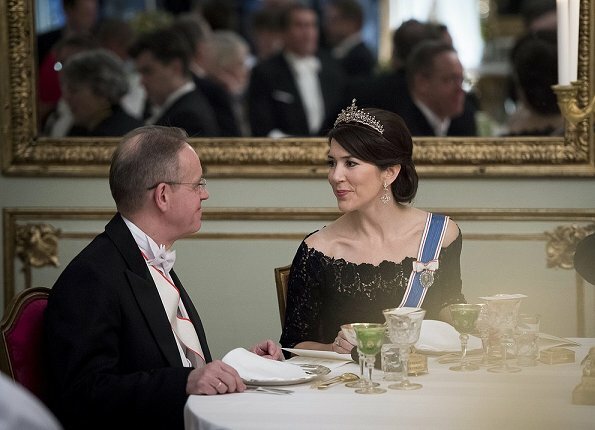 Mary's Tiara is lovely. Is she wearing it for the first time? It is old Edwardian tiara Mary bought from auction few years ago, it convertible necklace tiara. She has worn it both as tiara and necklace before. The queen and Benedikte look lovely. Mary's dress seems to be a combination of a top and skirt that don't belong together - even the colours don't seem to match. That said, she looks glowing and happy! Marie's dress is strange - what's with the odd raised waistline and the seam at mid-skirt level as Myriam noted? 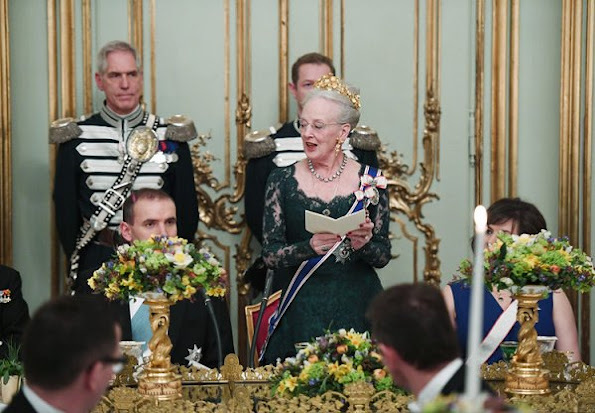 The queen's gold crown is a bit much. 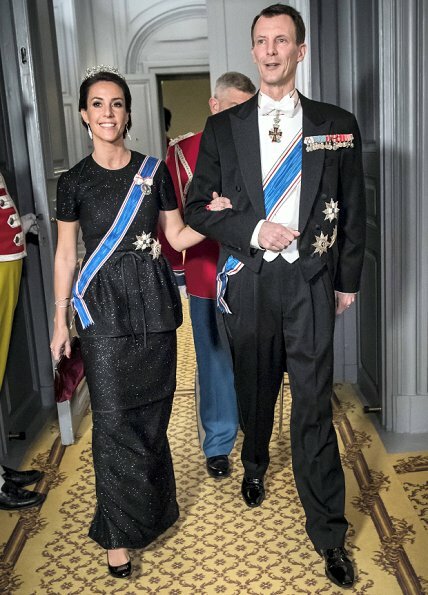 I can't remember when I last have seen princess Marie wearing a trendy fashion gala dress, but this one is among the worst, she has been wearing, IMO! Has she made some changes on it herself, it looks a bit 'homemade' ? Ich mag es, wenn Mary Schulter zeigt, sie hat einige Abendkleider mit dieser Schulterschnittführung. Edelste schwarze Spitze (handgeklöppelt und in einer Truhe in einem der Schlösser gefunden?) und nachtblauer Seidensatin gehen immer. Der 3/4 Arm des Oberteil ist elegant; der an der Hüfte asymmetrisch angesetzte Rock gibt der Robe etwas Beschwingtes. Tiara und besonders die Ohrhänger sind genau richtig gewählt. Toll!